A world-class sports car in every way, the new Chevy Corvette Z06 is nothing short of staggering. With a supercharged 6.2L V8 engine that gets 650 hp, the Corvette Z06 is able to move from 0 to 60 mph in just 2.95 seconds. Get yours with the standard Aero Package or upgrade to the Carbon Fiber Aero Package or Performance Package. 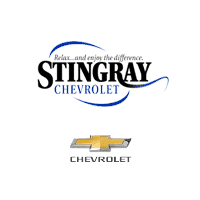 Experience the sophistication and unmitigated performance of this uncompromising Corvette, and check out your Chevrolet Corvette Z06 lease and financing options near Brandon at Stingray Chevrolet in Plant City. Test Drive the Chevy Corvette Z06 Near Zephyrhills Right Now! See everything that sets the new Chevy Corvette Z06 apart from the sports car competition, and chat with the staff at Stingray Chevrolet about all the performance features on this supercar. While you’re here, make sure to check out our current Chevy offers and incentives. Our dealership is located near Valrico in the heart of Plant City, and you’re welcome to call us at (813) 359-5000 with any questions!